June, in Padua, is the "mese antoniano" (The month dedicated to St. Anthony) and the day 13 June is the day in which the Saint was born and that the Catholic Church chosed to celebrate him. Exactly around this period, a couple of years ago (10 June 2014), we presented in Padua the Forensic Facial Reconstruction of the Saint , which was performed during the preparation of the open source exhibition "Facce. I molti volti della storia umana" ("Faces. The many aspects of human history") . Today, with a big delay (sorry, too few time...) I'll go on sharing, with open source licenses, the material we produced for the exhibition and, considering the recurrence (13 June), I'll upload some media regarding the Forensic Facial Reconstruction (FFR) of St. Anthony. First of all, here is the image of the final model, which is already available on Wikimedia Commons. 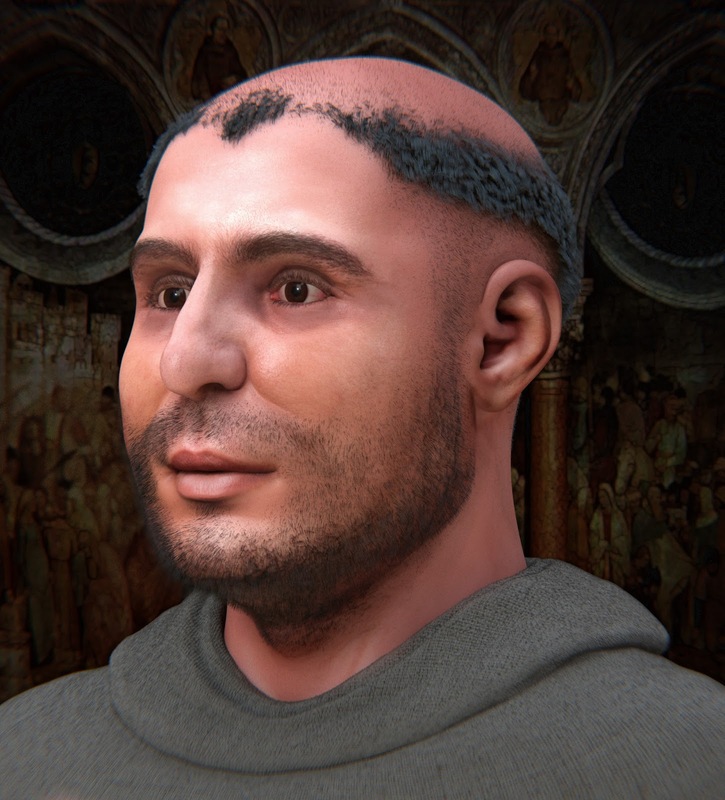 The credit for this image are (in order of work-flow): Luca Bezzi (Arc-Team) and Nicola Carrara (Museum of Anthropology of the University of Padua) for the 3D scanning of the cranial cast of the Saint; Cicero Moraes (Arc-Team) for the main work of digital Forensic Facial Reconstruction; Padre Luciano Bertazzo (Center for St. Anthoni Studies) for the historical validation of the final model. Moreover the project relies on on the previous work of the artist Roberto Cremesini, who produced in 1985 the bronze cast of the skull and the jaw of St. Anthony, used for the digital reconstruction (2014) and on the research directed by Prof. Vito Teribile Wiel Marin, who directed the anthropological study of the skeletal remains in 1981 (with particular attention to the work of Prof. Gino Fornaciari, Francesco Mallegni and Giorgio Ragagnini). Then I report here the complete presentation we did during the "Giugno Antoniano", as until now in ATOR we just published the second half of the slides (by Cicero Moraes) and never the first one (regarding the digital scanning of the bronze cast done by Roberto Cremesini).